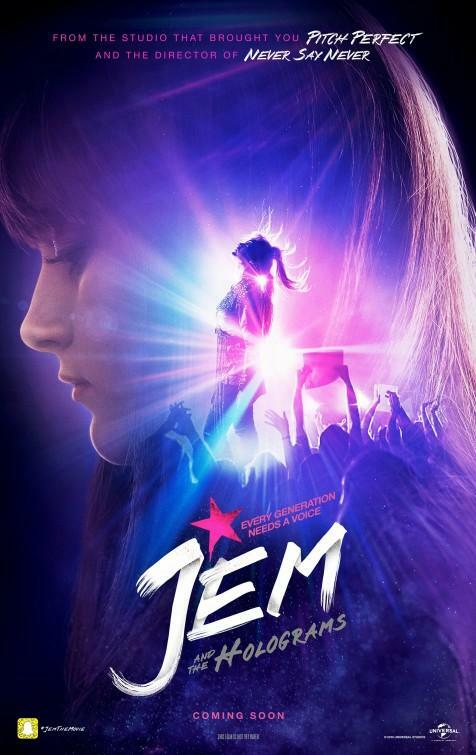 Jem and the Holograms Trailer: Welcome To The Blonder-dome | "DESTROY ALL FANBOYS!" Not being a fan at all of the old cartoon and spending time watching a few too many old episodes over the last week or so makes me an easy judge of how this film will do at the box office. The answer is “terribly or worse” for a few key reasons. Reasons one and two: Based on poking around the internet and reading a few too many “totally outrageous!” comments, the older fans didn’t ask for it and the younger ones don’t really exist. That is, unless they have parents trying too hard to be their best friends and think this is a gateway to that friendship. Cue the future news stories of kids possibly bumping off those parents in their sleep after being taken to see this turd. Sorry, but the whole sappy dramatic movie of the week look of this unspecta-clueless trailer screams “Lifetime quickie flick!” more than something worth paying money to sit stupefied in front of. Hell, at least the live action Josie and the Pussycats flick didn’t go for schmaltzy “realism” at all. It wasn’t a good film at all either, but it at least went down in flames winking at itself. Anyway, Hollywood has been suffering from remake-itis for decades, but this cobbling of ancient cartoons and TV shows only boomers who haven’t grown out of them yet will recall with any sort of warm nostalgia (nope, that’s not a mild case of incontinence) is getting out of hand. Ah well. This one will pop up on cable within what, eight or nine months of its theatrical release? Probably. Will I watch it? Probably not. But curiosity has drawn many to many a train wreck, so as always… we shall see. This entry was posted in 2015, Commentary, DAF, Humor, Movie Posters and tagged Bad Ideas, Coming Soon, Girls Gone Mild, Jem and the Holograms, Movie Trailers, Movies, Opinion, Universal Pictures, YouTube by geelw. Bookmark the permalink.